St. John’s College UBC was built in memory of the original St. John’s University, which was once one of China’s most prestigious and influential universities. Symbolically, the College is next to the Pacific Ocean facing Asia. 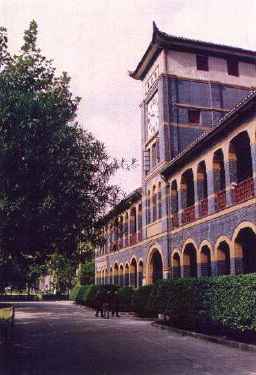 St. John’s College is part of a proud heritage, which dates back to the famed St. John’s University in Shanghai, China. Founded by American Anglican missionaries in 1879, St. John’s University was one of the most prestigious post-secondary institutions in China during the first half of the 20th century. Often regarded as the Harvard or Yale of the country at the time, it was both a trail blazer in the development of higher learning in China and a facilitator of cultural exchange between China and the world. SJU introduced the American liberal arts model of education to the country and was the first in China to offer programs in psychology, journalism, business, and graduate degrees. The university was also the first post-secondary institution in China to include modern sports activities in its learning. It sent athletes to the first Asian Games and founded the earliest professional soccer and basketball teams in China. SJU also encouraged student self-management and started China’s first student associations and publications. Curriculum at the university was based on a Christian core, but also promoted, in the liberal arts tradition, a free spirit of learning in which students selected most of their courses out of interest and were encouraged to study a broad range of subjects. The university used English as its pedagogical language, which enhanced the ability of students to communicate with the wider world. The university was also registered as a university in the US rather than China, making its degrees recognized by academic institutions abroad and encouraging overseas study among its graduates. It, however, also taught respect for China’s Confucian heritage and placed learning it on equal terms with Christianity and other knowledge. SJU excelled in this progressive outlook until political circumstances in China forced the closing of the institution in 1952. SJU graduates, calling themselves Johanneans, have tried to keep alive the traditions of their alma mater following its closure by forming an alumni network with chapters around the world. They also funded the establishment of academic institutions that would bear the name of St. John’s and embody the cross-cultural learning and academic excellence of the original university. St. John’s College is one of three establishments around the world formed through their efforts. Created through the cooperation between global Johanneans and the University of British Columbia, St. John’s College was founded in 1997. Unlike its predecessor, SJC is not a religiously affiliated teaching facility. It, however, carries on the liberal arts tradition and cultural exchange of St. John’s University by serving as a forum for communication and bond building between people of different cultural and academic backgrounds. The College provides residence to graduate students, junior faculty, visiting scholars and postdoctoral fellows at UBC and hosts a variety of academic events on campus. Its goal through this is to bring together learned minds that span the different academic and national divides and to enrich and broaden their understanding through participation in College activities and living with those different from themselves. St. John’s, through this process, hopes to produce a new generation of Johanneans who would bring achievement and service to their home communities and work towards the larger cause of global cooperation.